I know. My presence has been scarce. But in my defense, I’m sick. And I don’t feel like doing anything. I haven’t gone to the gym. I haven’t cooked a meal. I haven’t done laundry or cleaned anything. I didn’t go to work yesterday. I went today, but I did a couple of things and then sat in my chair moaning and groaning until the phone rang at which point I put on my best “I’m okay!” voice and answered it. I did get one productive thing done today, although it was not work related. I’m working on putting together a shutterfly book of wedding photos, and I got that going. So, here’s a sneak peak. And that’s all you get for now because I’m going to go back to dying on the couch now. This is one of my favorites of me getting ready. 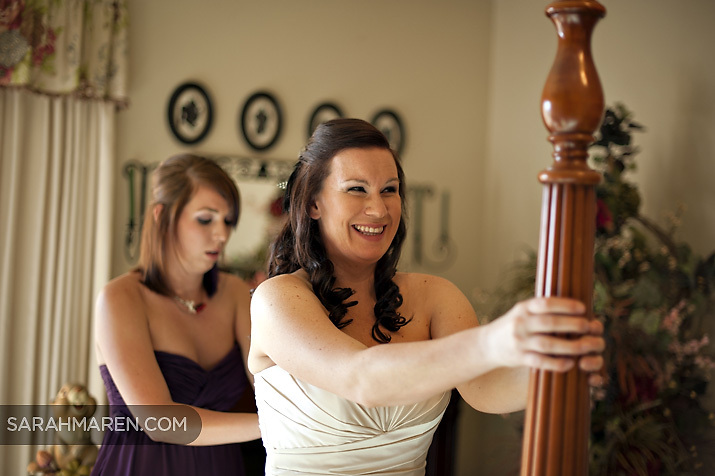 My maid of honor, Kayla, was tightening my dress and I had to hold onto the bed to keep from falling over backwards! Anyway, ta ta, folks. Hopefully I’ll have more energy and things to say tomorrow.